RESS makes your life easier by centralizing all of your facility or event management into a single interface. RESS gives you the power of an enterprise reservations system with the simplicity of a desktop application. You are able to manage rooms, schedules, equipment, event registration, catering menus, invoicing, and more all from one computer. Join the ranks of our satisfied customers; whether you are an event planner, a church, or a major University, RESS is the right choice for you. 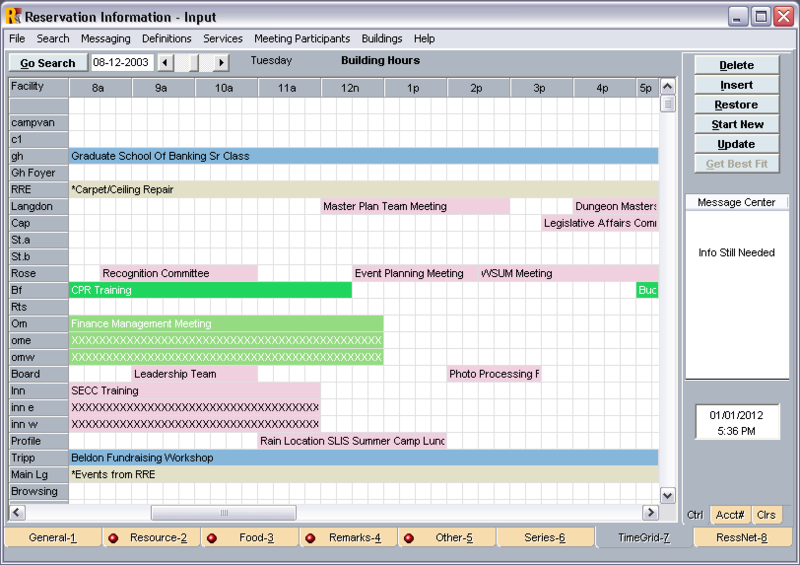 Pros: What I like most about this software is that it is easy to use when scheduling an event. The drop down menus for certain categories are very useful and convenient. Cons: What I like least about using this software is the printing feature. Printing the actual calendar can be complicated. Especially when you can't just hit print and the parameters are difficult. Pros: The application allows us to update an events calendar that is shared among staff so as to avoid confusion or interruptions for individual events. Cons: The application seems very convoluted and unwieldy. At times you think you are lost in a vacuum of tables and grids that seemingly don't serve a purpose. Overall: Helps to keep staff notified and updated about room usage and schedules.